Greetings, fellow ECCE associates. My name is Malcolm, a Master’s candidate at Western University in London, Ontario. It’s been almost three months since I shifted my life 4000 kilometers due east of my hometown of Surrey, BC; that’s a network distance, not Euclidean. The usual adjustments to new geographic phenomena occupy a corner of my mind everyday – the quirkiest one to date being that I’ve been taught to lift my vehicle’s windshield wipers up, to avoid them being frozen to the glass. As a fresh grad student brought into one of the largest Geography-Department-based research teams on the continent (HEAL Lab under the direction of Dr. Jason Gilliland), I was eager to apply my skills, diffuse my knowledge, and determine my research aims. Rapidly, there were many opportunities to discuss and present my previous history with applications in GIS, and I jumped at those opportunities without hesitation. My undergrad academic experiences plus subsequent private sector consultations were diverse, driven by various applications in GIS: fluvial geomorphology, agricultural economics, and urban markets modelling. Nevertheless, one can get tired talking about what they did before entering their Master’s program. They can also get tired pontificating on what they might do for their Master’s thesis; the ping-pong effect of professors and postdocs singing in your ear on what they imagine you doing can start to irritate. I myself am still amid a systematic literature review to determine precisely what my thesis will be. Three months in, and it is broad categories that define it (GPS, children, physical activity, algorithms). I held out hope that an Esri User Conference in Toronto could provide some insights that I could translate into a workable theoretical direction. Alas, the conference was largely aimed at the software & data broker industry. Esri agents highlighted new tools, and enhancements of existing tools, most of which were incremental in the novelty they bring to the GIS realm. They are fantastic, intuitive tools (I was particularly dazzled with Indoors), but they remain tools, awaiting input from a researcher’s grey matter to analyze a hypothesis. Ultimately, at this early stage, I cannot claim to be applying myself rigorously in the GIS area. That doesn’t mean I never double-click those EXEs. As I mentioned, I was eager to help the research team. Practically speaking, that has resulted in a pseudo tutelage of Health Sciences grad students, especially those unfamiliar or inexperienced with GIS products and geographic theory. They lack in GIS skillsets, and interdisciplinary teams (the core of academic Geography) can rescue them from a miasma of ad-hoc training. Therefore, my GIS experience in grad school has been piecemeal but pleasant. 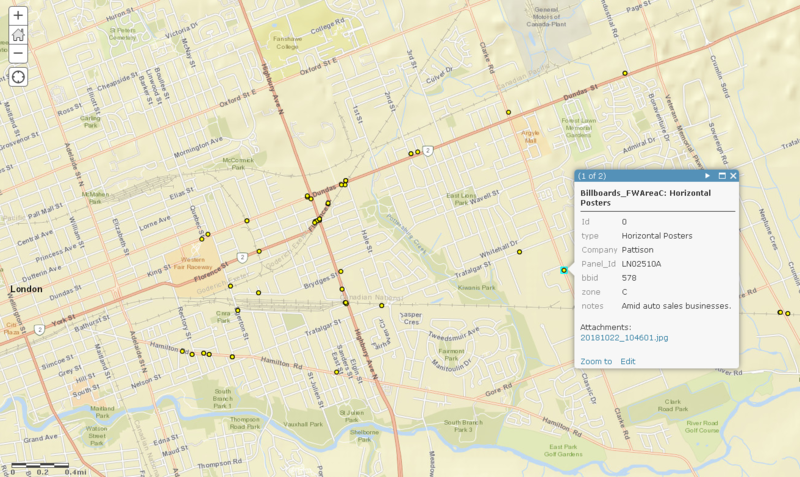 I have delved into the implementation and use of Collector for ArcGIS, to collect visual data of the food environment in London, Canada (see Fig 1). I have aided Health Sciences grad students on geographic characteristics, by either informally training them or answering their questions. 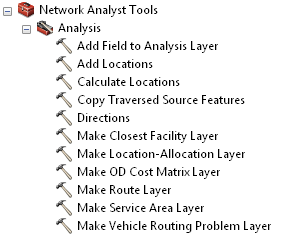 In particular, ArcGIS Pro and the Network Analyst extension have become the new foci of certain peers. ArcGIS Pro has been a learning experience for me as well, mainly to figure out where the heck I used to find or execute something that has been placed in the new ribbon-based UI; this old dog found out he was well indoctrinated by Desktop’s Toolbar/Toolbox interface. Meanwhile, the core of my geospatial knowledge is getting fed a buffet on a regular basis. I have dived into peer reviewing articles submitted to journals that focus on Public Health Geographies, particularly articles utilizing geospatial technologies and methods readily entered & analyzed in Esri’s lineup of products. The pervasiveness of ArcGIS in the Geography academic sphere is almost universal – it’s rare to see any other GIS software mentioned. Esri and universities are tied at the hip, a legacy of viable markets and the inertia of contented professors. In recent weeks, I’ve finally been delving into the research behind GPS tracks and how to effectively summarize their extracted point data within various spatial binning techniques (hex bins probably come to mind for most of you). Additionally, I’ve discovered that temporal & subjective aspects of participant’s daily lives are seldom accounted for in multicriteria GPS-based algorithms. A workable theoretical direction may be within my immediate grasp. Otherwise, it’s been a smooth start to grad school, yet I’m raring to delve deeper into the geospatial. Use of Esri’s tools will naturally come with that progression. Indoors, I’m looking at you!